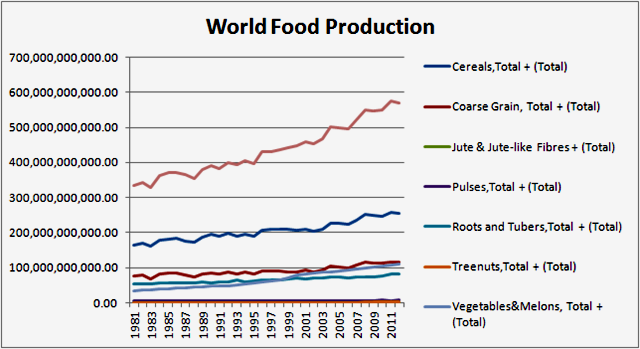 Climate Change And Food Production …… PER CAPITA!!!!!! True, Treenuts haven’t increased that much, but, as any idiot can see, the rest has. When totaled, against the world population growth, it looks like this …. Now, I’m not a genius ….. wait….. technically, I am. 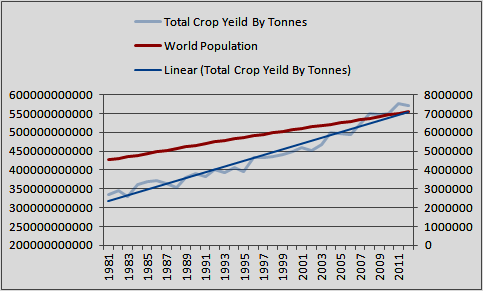 Still, genius or not, I think any idiot can see that world crop production is increasing per capita. FAOSTAT is the source of the entire dataset. When my near vision gets just a bit better, I’ll break it down to calories and protein. I promise the graphs will look the same. The world has never been fed better than it is today. That’s not to say we don’t need to keep improving, we do. But, we should, and can never allow the lunatics to start thwarting the progress we’ve demonstrably made in alleviating world hunger. We need to ensure the bastards removed who would seek to alter this course. This is one of humanity’s greatest works in progress, guard it jealously!!! 19 Responses to Climate Change And Food Production …… PER CAPITA!!!!!! but but but…rice is going to be less nutritious…doncha know! caveat: we have been breeding rice for hundreds of years to perform at lower CO2 levels……..
And then there is golden rice. Yep! Except calories and protein are increasing at just a bit higher rate than crop production. I just don’t understand people who would lie and then believe we’re stupid enough to believer their BS, especially when they link to the same source. They’re either abjectly stupid, or unfathomably evil. I would say, most journalists are stupid and evil; the readers who constantly read the journalist’s litany are just stupid (because they trust stupid and evil journalists). Or in other words, they constantly get brainwashed into believing the antarctis is collapsing, the world is starving etc. It’s good business for the stupid and evil journalists. They need this business, because they are too stupid for real work. And that is the cause of global warming! We have to slash food production and starve everyone! The company line from the team. Makes ya wonder doesn’t it? Not any more. I know their ends. I only laugh at their subterfuge. The earth is greening. That’s a fact. Arid regions that formerly did not support agriculture are now producing food. By all measures, the warming of the 20th century has produced far more benefit to the world. None of the fabricated horror stories of man caused global warming have come to pass despite we now live in the time of their prediction. Warmists what all these wonderful benefits to civilization and planet to stop. They’re a bunch of moon bat crazies off their meds. They’re a bunch of moon bat crazies off their meds. It fits pH to a tee. They saw “A beautiful Mind” and thought they were as smart as Nash. Darwin and Malthus both worked for the East india company at the same time. Malthus said, world is finite, potential number of humans is not, uh-oh; Darwin said, selection will make sure the fittest survice – taking Darwin and Malthus together, the perfect pragmatist ideological foundation for killing a few millions here, a few millions there (they did that in India, by increasing taxes and forcing people to farm “cash crops” instead of food, leading to mass famines as soon as a harvest failed – a nice self-made confirmation for the Malthusian horror scenario. Over the years, 85 million famine dead til the collapse of the UK empire). Darwin made a fundamental mistake, if he really did say ‘survival of the fittest’, for ‘fittest’ implies such at a single point in time or in an equilibrium. Both of those don’t exist on Planet Earth. Biological organisms follow these rules: Be fruitful and Multiply, alter the environment locally to enhance the odds of #1, and finally, be fit enough to survive the unexpected. Organisms that don’t follow those three rules get replaced. Sometimes, those that do get replaced anyway. Yeah well I won’t go into his exact verbiage, or of his cousin Francis Galton, who invented Eugenics; might have been Galton who coined that particular slogan; I’m talking about the East India company, their employees Darin and Malthus and the ideology that they created that justified the genocides committed by the company / the UK empire. You are absolutely correct James. But its a tenet of the progressive green religion that we’re all going to starve. Using solar energy to desalinate seawater, warm a greenhouse and grow food in a desert is fully in tune with green ideology, and would produce food where now there is nothing but sand and Islamists. All you would need is a canal to bring the sea water inland and you could produce food all over the Sahara (assuming the Islamists don’t mind). And if they still don’t like it, point out that it is the perfect way to grow vast amounts of marijuana. Well that’s why we don’t do it. It’s too expensive. But might be a great subsidy harvester. Oh, I agree with you Dirk, it is too expensive. But jujitsu is the art of using your opponent’s strength against them, and this Green technology destroys their whole argument instantly…since Greens never argue cost benefit analyses, so they can hardly complain about the cost of something which would massively increase food growing acreage.